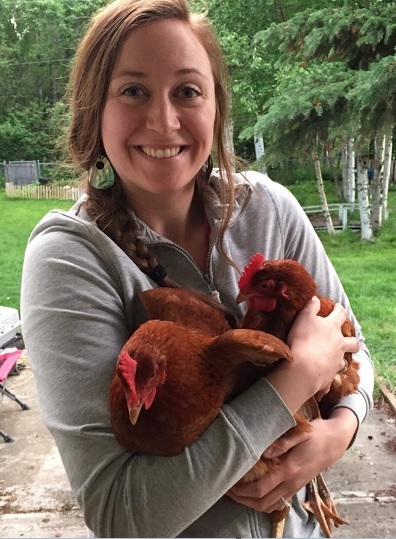 When keeping backyard chickens in Anchorage became legal about four years ago, Larissa heard the news & jumped into action. As a passionate permaculturist who has stayed in an earthship before (a totally sustainable home, right down to indoor food production), Larissa has her professional permaculture design certificate and her own blog, Pragmatic Permaculture, to document planting and yard progress year to year (as well as offer gardening consults and classes). 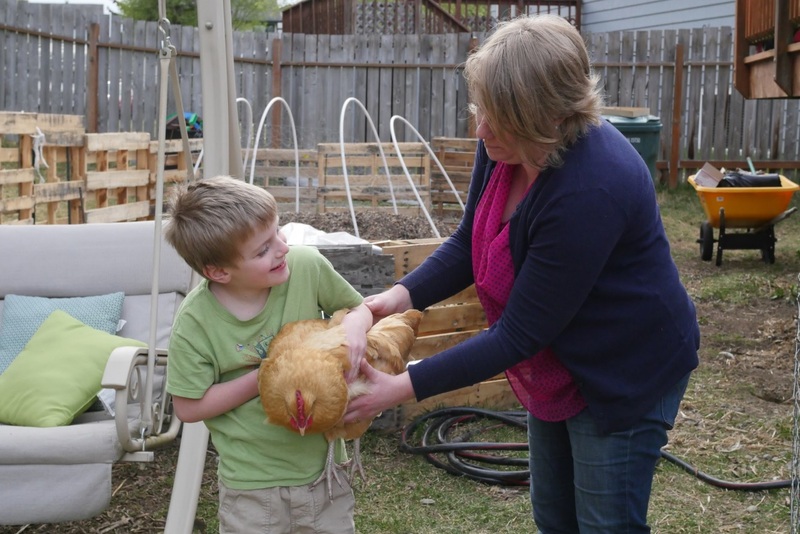 Adding chickens was a natural next step in her gardening/composting cycle of sustainability. She had never owned chickens before, but did her research fast, furious & thorough. 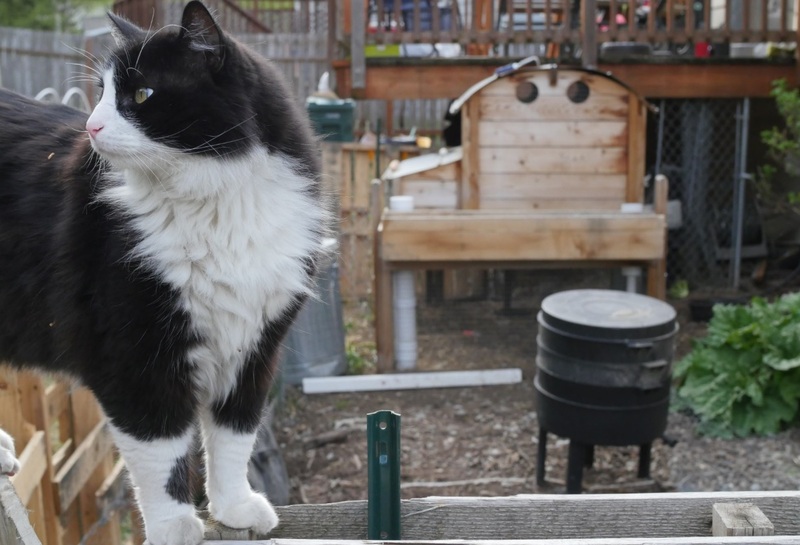 When deciding between getting chicks, pullets or laying-aged hens, Larissa thought it was wisest to start with full-grown, standard-sized hens since she has a cat who’s an excellent mouser. She currently has 5 hens, a handful of which are now about 5 years old but still laying eggs almost daily. Not too shabby. While first starting out as a chicken owner, she had fun converting colorful children’s playhouses into adorable chicken coops. But after she got a few more hens (chicken math happens), the cute playhouse coops were too small for her flock. She started looking for coops made locally, but it seemed that most chicken coops made in Alaska were in the Palmer/Wasilla area and she didn’t have the means to transport an already-assembled coop over that distance. She found a few “assembly required” coops at local stores, but they all seemed cheaply made or she wasn’t happy with the design and she wanted her larger chicken coop purchase to be an investment that would last for years to come. She eventually found a coop manufacturing company from the Lower 48 that was willing to ship to Alaska – and even tossed in delivery directly to her doorstep. There was assembly required, but it wasn’t too terribly difficult and the parts were of the quality she had been seeking. 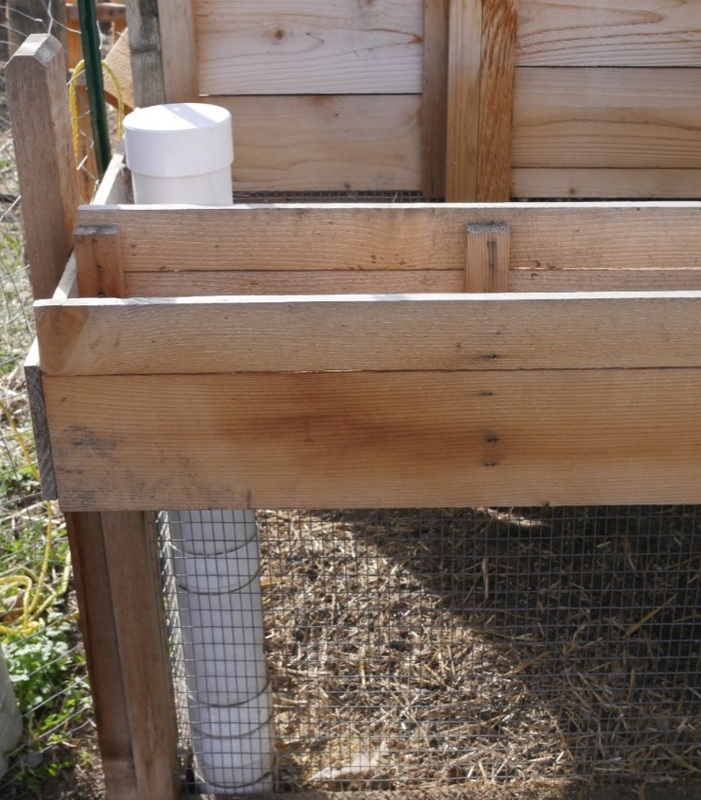 The coop design included a nice tubing system for feeding and watering the chickens in the run area. It also has a built-in planter, which Larissa plans on fully taking advantage of this gardening season. Larissa’s only complaint about the coop design is the nesting box area. When she’s just collecting eggs, it’s perfectly functional. But when she has a broody hen that she wants to get out of the nesting box area, things get tricky because the nest box doesn’t open large enough to get more than one hand in at a time. But all things considered, she’s still happy with her coop purchase, years later. Wintertime in Alaska – heat or no heat? To heat or not to heat, that’s always the big question for Alaska chicken owners come wintertime. For Larissa, the best answer is no heat, no light. Her hens have always done just fine in the winter (no frostbite), which is good, because there’s not an easy way for her to run power out to the coop. Soon after she got chickens, Larissa immediately got a letter from the municipality saying they received a complaint about her chickens and the city was required to perform an inspection of her property. She didn’t know which neighbor called her in, and she didn’t know why. All she knew was that the municipality was getting involved, and even though she was under her legal limit of chickens and her setup was well off all property lines, she was still nervous about what to expect and disheartened that a nearby neighbor would report her without ever coming to talk to her first. An inspection woman from the city of Anchorage came to Larissa’s home and took a quick look around her yard. After what seemed like no time at all, the inspector thanked Larissa for letting her come by and said she doesn’t have anything to worry about. 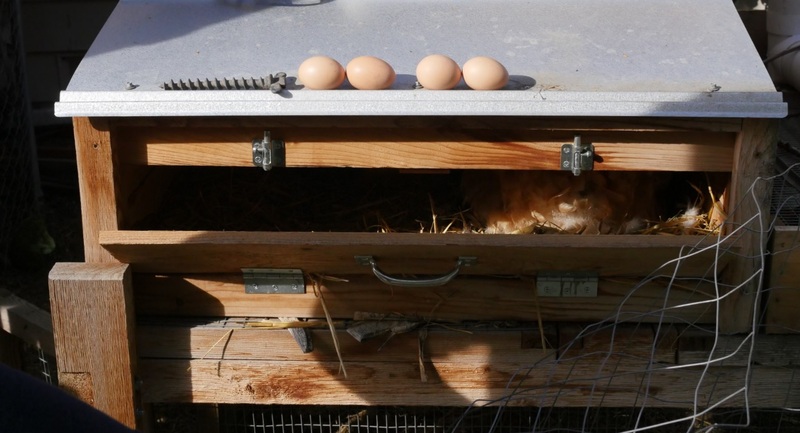 Apparently a lot of people in Anchorage just weren’t paying attention to new city codes that legalized backyard chicken keeping, and phones had been ringing off the hook with invalid complaints of “illegal” poultry activities within city limits. 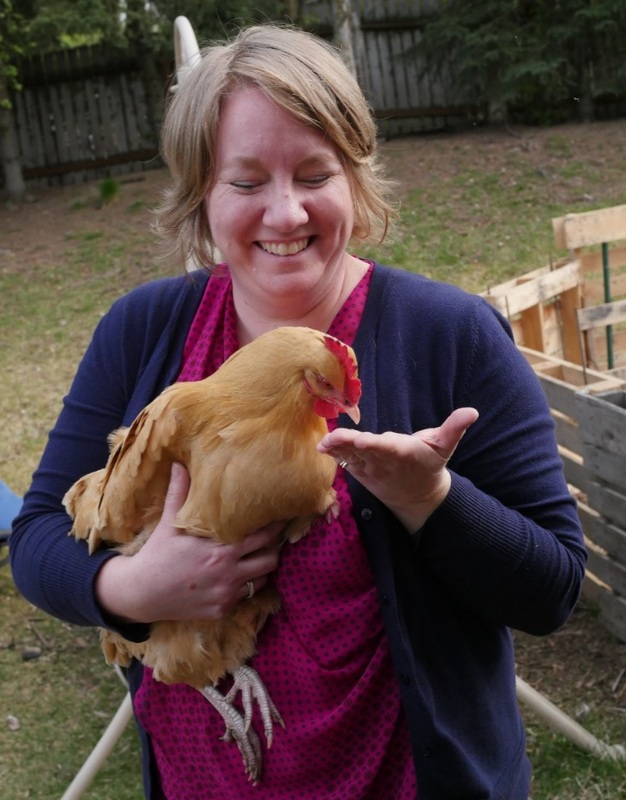 Anchorage was still at the beginning of an ongoing culture shift toward accepting urban backyard chicken keeping. 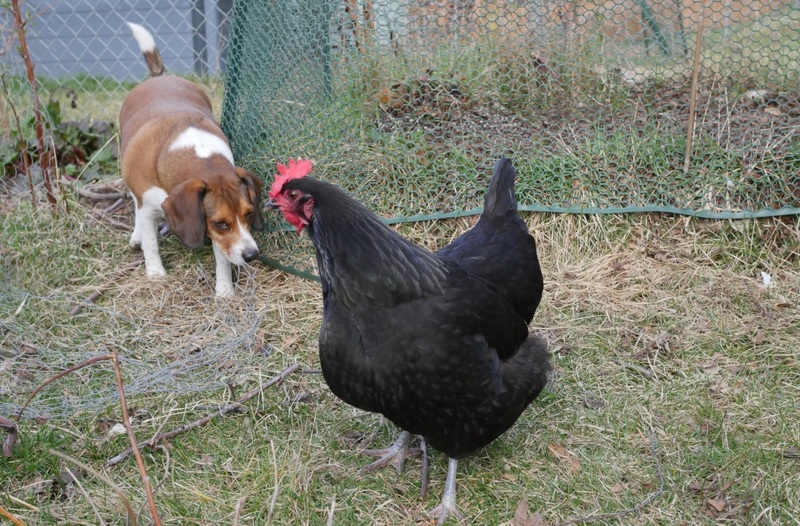 In the years since backyard chicken keeping in Anchorage was legalized, Larissa has only lost one bird to predators. Although her run area isn’t covered, she almost always lets her chickens free range around her yard, which has plenty of trees and bushes, and she’s only ever owned full-sized, adult hens. One day she was in the yard and saw a hawk high in the sky, paying special attention to her yard. Before she could react, the hawk swooped down as the chickens scattered and took cover. One of her hens scrambled under the wide leaves of a fully mature rhubarb plant, but the hawk saw where she went and followed after, pulling her out from under the plant’s protective leaves and killing her with ease. The hawk was nearly the same size as the chicken, proving that not only chicks, pullets and bantams are vulnerable to aerial predators. 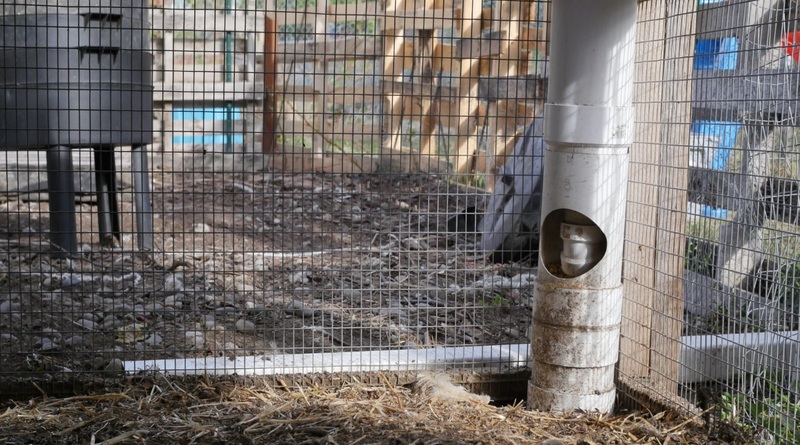 Larissa has been considering putting netting over her run area, but her chickens are generally either free ranging around the yard or tucked inside their coop, so it wouldn’t add much protection. And luckily that sole hawk attack seems to be an isolated event. Larissa has one dog (a beagle) and a large indoor/outdoor cat. They both get along great with the chickens. She’s never had a problem with her four-legged pets and her chickens, and her yard is fully fenced in, so loose neighborhood dogs have never been an issue. 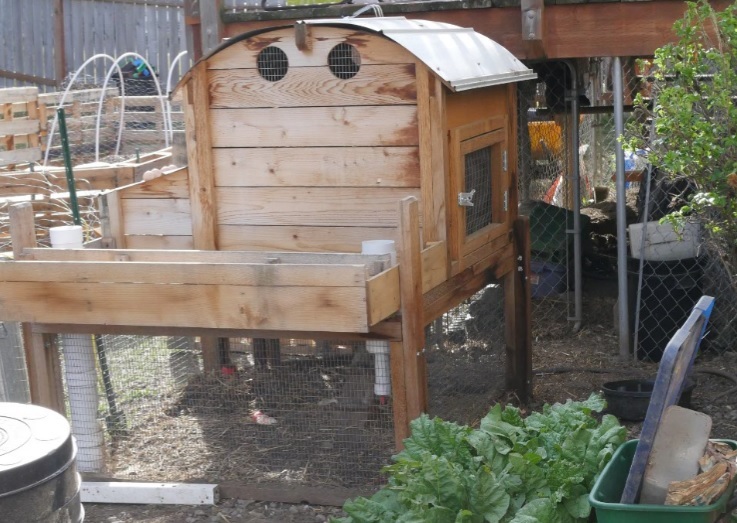 Even though Larissa is a permaculture gardener and has an impressively large garden bed in the backyard next to the chicken coop, on most days her chickens get to free range around the yard as they please. Just when you think you’ve seen every use for recycled wooden pallets, here’s a photo of Larissa’s magnificent garden area. 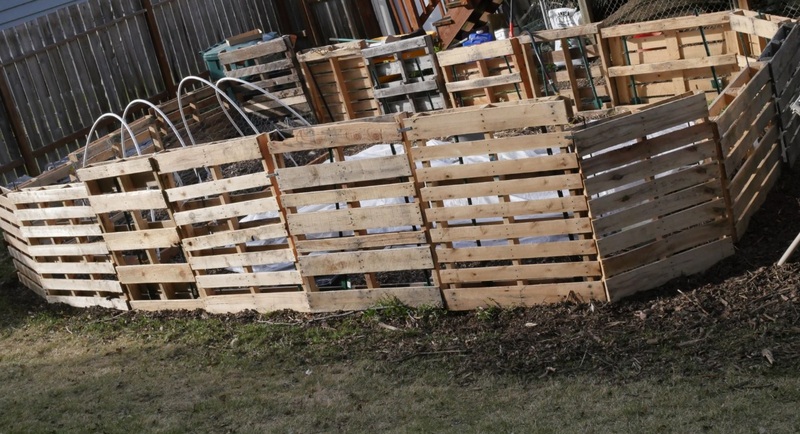 Instead of building an expensive fence, she assembled a blockade around her main garden bed out of recycled pallets. And it really looks great. Even though it’s only a few feet tall, her chickens have enough space and other places to scratch and peck around the yard so they leave it alone and aren’t tempted to fly over the pallet walls. Thinking back to when she was still just researching chickens but wasn’t an owner yet, Larissa’s husband and two boys looked at her like she was a crazy woman. Now all of the family is onboard and loving access to fresh eggs and the constant entertainment that urban chickens provide. To anyone out there who currently doesn’t have chickens in their yard but is debating whether or not to get started, be warned – they’re seriously addicting but oh-so rewarding! Oh my goodness, this is a great article! I have been considering getting chickens and the more I read, the more I think it may be great! Thank you for the great information in this post! I am curious, do your boys help with the chickens?